Disagreement is brewing between officials in the marine sector in Ethiopia and Djibouti over the use of the Port of Djibouti, and whether or not Ethiopia's flagship carrier should continue to pay security fees, reliable sources disclosed to Fortune. The management of the Port of Djibouti, DP World, has rejected a request made three months ago by the Ethiopian Shipping Lines (ESL) to be granted a dedicated access to two of the 15 berths at the Port. The two berths ESL showed strong interest in are berths number one and two, which were handling containers, fitted with two gantry cranes. Signed by Jerome M. Oliveira, chief executive officer (CEO) of the Port of Djibouti, the letter DP World wrote on June 21, 2009, says it "would not be possible for Djibouti Port to honour" ESL's request. 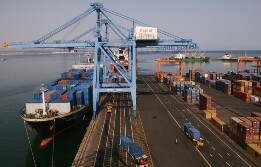 Ambachew Abraha, managing director of the ESL, first made his request when he met Aden Ahmed Douale, chairman of the Djibouti Ports and Free Zones Authority, in March 2009; he had expressed his company's desire to lease the container terminal at the Port of Djibouti, these sources disclosed. He subsequently wrote a letter to Douale three days after their meeting in Djibouti, including a request to be waived from security fees ESL pays per container, which is close to six dollars, according to these sources. ESL request is followed the completion of a brand new port at Doraleh, which incorporates both oil and container terminals. Consuming a total investment of 400 million dollars, the investment raised from the Dubai based DP World, Doraleh is built 13Km east of the Port of Djibouti to earn a reputation as the largest in East Africa; it can handle 1.2 million containers (20ft) annually. DP World Djibouti has made a decision to move all operations related to container handling to the terminal at Doraleh, leaving the old port to the operations of general cargoes. Nevertheless, ESL managers argue that their vessels are multipurpose in character, including Ro/Ro (carrying vehicles), general as well as bulk cargoes. They claim that going back and forth between the new and old port facilities would subject them to additional costs.